Video conferencing has come so far in the past few years. If you follow the industry you know web conferencing software provides like: BlueJeans, Spontania, Vidyo and Zoom.US are providing "H.323 & SIP" integration with their cloud based services. In essence, this is connecting the traditional video conferencing systems from Polycom and Cisco to the cloud without the need to purchase expensive hardware. Without going into too much detail H.323 was the original standard protocol and SIP is the new and improved protocol (more info here). "H.323 Gateways" or "Room Connectors"
BlueJeans is definitely the pioneer in the space followed by Vidtel. 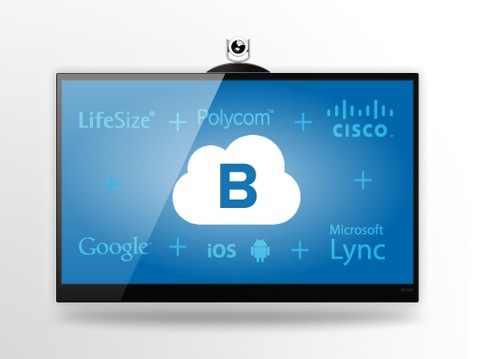 When Bluejeans was released in 2011, they were the first company to bring together Polycom, Cisco, Google Hangout, and Skype all into one easy to use platform. From here BlueJeans continued to add support for various systems and new companies followed in pursuit. So for those of you who are not familiar with BlueJeans pricing model they have a entry fee of $12,000. Small, Medium or Large business must pay at least $12,000 to start. That's why CRS has partnered with Zoom.US to offer more affordable plans that start at just $9.99/Month for a host license and $45/month for the H.323 Room Connectors. Let's take a look at just how easy it is to connect a H.323 or SIP video conferencing to the cloud using Zoom.US in this quick video. It's worth noting that whether you use BlueJeans or Zoom.US you cannot simply call a H.323 system. It works the other way around. You must invite H.323 & SIP system to your IP address and so they can join the cloud meeting. Update: Spontania can make direct calls to a H.323 or SIP endpoint. 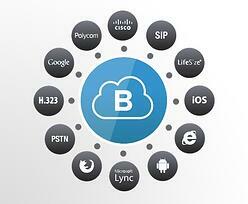 You can instantly iniate a call to a H.323 or SIP endpoint without leaving your meeting room. To make life easier with web video conferencing we have all gotten used to "one click" launching of meetings. Since this is not possible with H.323 and SIP systems (and never was) web video conferencing providers are making things easier by simply proving a IP address in the meeting invitation. That way if you are unsure who may need to join via H.323 or simply want to have support from your end, you have it. 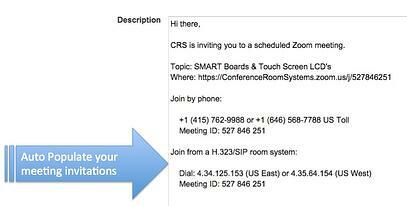 Here is a example Zoom.US meeting invitation that has "auto-populated" with the IP information needed to connect H.323 and SIP systems to the meeting. Check out our review of the top 5 conference room booking solutions here. Learn how to check your conference rooms bandwidth for video calling here. Looking for conference room computer? Check out how to install the Intel NUC here. Learn how to connect h.323 & SIP conferencing systems to the cloud here. 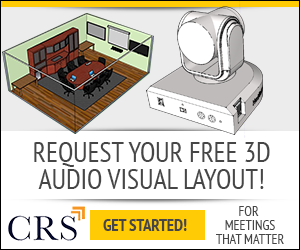 Top 10 tools for audio visual design and conference room managers here. Learn more about lighting for video conferencing in your meeting rooms here. Learn all about video conferencing strategy here. Learn about designing “Zoom Rooms” for video conferencing here.